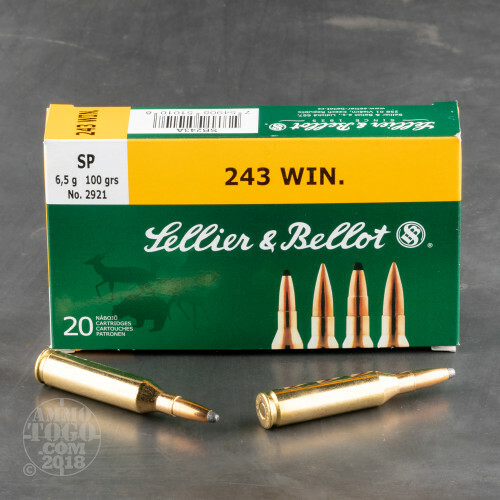 This 243 Win cartridge is made by Sellier & Bellot, one of the world’s oldest ammunition companies and one that accordingly has learned their craft inside and out. The round sports a 100 grain soft point projectile. The bullet’s precisely engineered jacket is extremely concentric, and thus able to provide the rotational stability needed for straight flight en route to its target. So precisely drawn a jacket is able to facilitate highly uniform expansion during penetration, and also endure the weight retention needed to create a deep wound channel. Without asking for very much, this round will give you precisely what you need to bag big bucks this upcoming hunting season. Sellier & Bellot’s brass casing is just the right stuff for handloading, so this round’s is worth holding on to after your rifle spits it out. Their Boxer primer is very dependable and non-corrosive as well, and their propellant is measured to produce a consistent muzzle velocity and chamber pressure. How Far Can You Accurately Shoot with a .243 Winchester? Even larger bullets loaded into the .243 Winchester have excellent trajectories. Winchester’s 100-grain Power Max Bonded ammunition only drops 3.3 inches at 200 yards when zeroed to 100. At 300, it drops 12.2 inches. For the bullet size, these are excellent trajectories. What is the Best .243 Winchester Bullet for Deer Hunting? That’s a tough question, but you should always choose a round that has an expanding bullet for hunting of any type. You’ll want a jacketed hollow point or ballistic tip round to ensure proper expansion, which will result in a larger wound channel and a faster, more humane harvest. For deer, you’ll want something on the larger end of the scale, which for a .243 Winchester cartridge is about 90 to 100 grains. When properly placed, this bullet size can effectively drop a whitetail deer and many other medium-sized game animals. Check out this article if you're unfamiliar with the common bullet types deer hunters use. What Firearms Shoot .243 Winchester ammo? The .243 Winchester is a rifle cartridge, and the majority of firearms that load this round are bolt-action weapons. Bolt-action rifles are known for their accuracy and effectiveness, allowing you to place one shot exactly where you want it. You can find semi-automatic rifles that shoot the .243 Winchester, but they are relatively rare. If you're unsure, check your firearm near the barrel area. 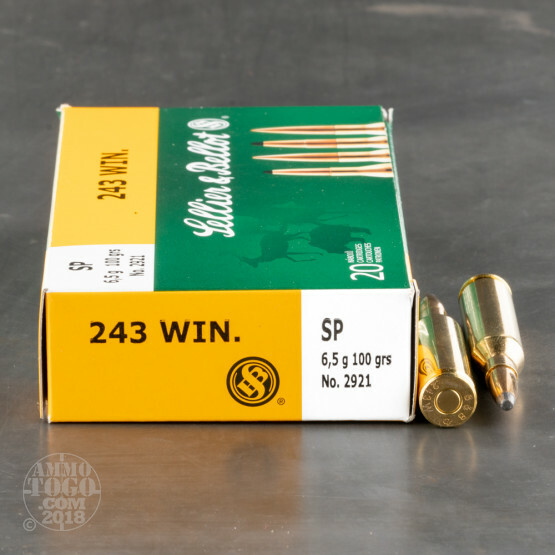 If it says it's chambered in "243 win" or "243 Winchester", this is the ammo you want. How Does the .243 Winchester Compare to the .308 Winchester? Considering that the .243 Winchester was based on the .308 Winchester cartridge, it’s easy to compare and contrast the two. A comparison also reveals the strengths and weaknesses of each. The most notable difference is bullet diameter, which are both reflected in the bullets’ names. 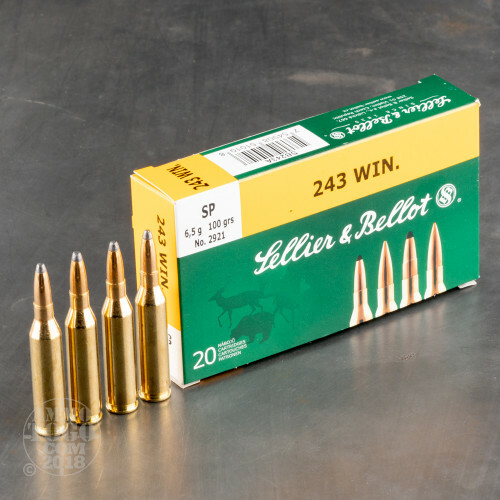 This difference is seen in the bullet weight as well; a .243 Winchester has bullets that go up to about 100 grains, while .308 Winchester ammunition will easily go up to 180, giving it far more muzzle energy. 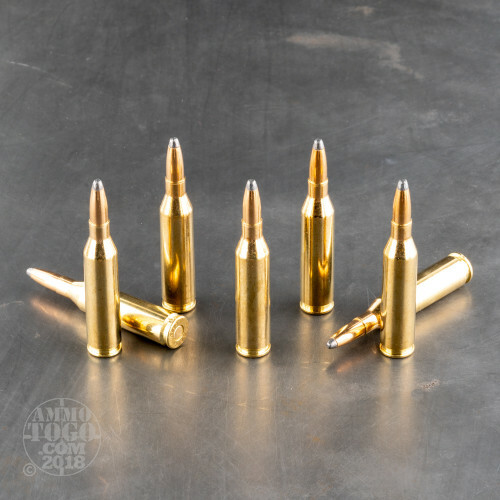 Speed, however, goes to the .243, which has cartridges rated over 4,000 feet per second in muzzle velocity; the .308 usually maxes out at about 3,100 feet per second.